Bitmain holds more Bitcoin Cash than Satoshi Nakamoto at 1,021,316 as of March 2018, amounting to $600 million at current prices and at nearly $1 billion at acquisition prices. 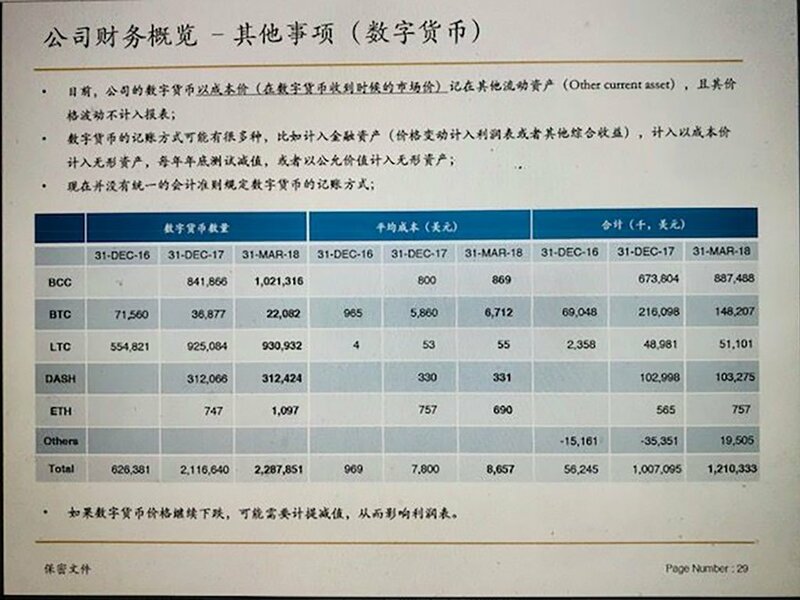 The seemingly leaked prospectus of Bitmain’s Initial Public Offering (IPO) further says they had 931,932 LTC as of March 31st, currently worth around $60 million, but their acquisition price is $51 million. Of Dash they have 312,424 as of March, currently worth $52 million, but their acquisition price stands at $103 million. Of bitcoin they have the second lowest amount in coins at 22,082, currently worth $140 million, while their acquisition price was at $150 million. For eth they have just 1,097 coins, currently worth less than half a million while their acquisition price was at around $800,000. First column: amounts held; second column: average price; third column: dollars times 1,000. Bitmain’s bitcoin holdings have been decreasing for the past two years, with their known bitcoin address showing they now have only 6,700 BTC, currently worth $42 million, as of August 12th. The above data, therefore, is slightly out of date. Thus we do not quite know of their current holdings, but there appears to be a trend of sorts. Firstly, they have probably kept all mined bitcoin cash and any BCH received as payment for their asics products, and have bought more bitcoin cash with fiat or other cryptos. That translates to Bitmain now holding 6% of all Bitcoin Cash supply as of March 2018, making them the biggest BCH holder by far. They clearly mine Litecoin and do so a lot. The same for Dash. They appear, however, to not be mining eth at all. Bitmain appears to be using bitcoin as the main source of covering expenses, with 14,000 sold from December to March, translating to nearly $100 million. Since March, they appear to have sold another 16,000, amounting to $200 million in combination for the past eight months at current prices. At sold prices it is probably closer to $300 million or maybe even half a billion. Why they’re selling bitcoin while keeping litecoin, dash and BCH is unclear, especially when one considers all three of those cryptos are mainly priced against BTC. Which can mean a fall in bitcoin’s fiat value probably translates to, at least in part, a fall in the value of the other cryptos. Eth as an outsider, at least up to March, tells its own story. Bitmain is in the asics business. Eth is mainly GPU mining, with some asics out there but they’re only a few times more efficient than GPUs, compared to say bitcoin or litecoin asics which are 50x or more efficient. Bitmain, thus, probably doesn’t mine any eth, with that one thousand eth probably just a tiny little bit of diversification. That may have changed since March, but the above figures seem to mainly reveal what Bitmain has mined during the period in question, with most of it seemingly held, except for BTC. For Bitcoin Cash, BCH’s difficulty was really low during some periods to the point blocks were coming in within seconds rather than the usual 10 minutes. However, to get to a million BCH they would have had to buy a lot of it, either by converting bitcoins to BCH or through fiat. That’s because since BCH created its own network on August 1st 2017, only 700,000 have been mined in total. Even if Bitmain had all of the Bitcoin Cash hashpower, they would have had to buy 300,000 BCH or would have had to receive at least this amount in payments for asics. As it is unlikely they have anywhere near 100% of the hashrate, it appears they have taken a stupendously big bet on BCH. That may change in the future because they are to IPO soon in Hong Kong. They closed a $1 billion pre-IPO financing round in July, with Bitmain hoping to raise $15 billion in the IPO at a market cap of $40 billion, higher than eth’s current market cap of $32 billion and just about half of bitcoin’s current market cap. Their revenue, apparently, was $10 billion this year, with $2 billion of it in profits. Huge sums indicating just how much money there is to be made in selling asics shovels. Franchement il faut absolumemt qu ils arrete leurs magouilles ! !